I have been veggie obsessed lately! Salads, sandwiches, wraps. I just can’t seem to get enough veggies. It’s easy, quick, healthy and filling. 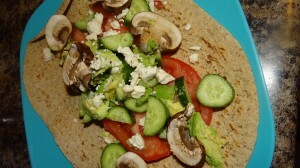 You can use any vegetables that you want, and if you leave off the feta it’s vegan. *I would have added fresh baby spinach, but I was out. Artisan Lettuce is also good. Add all of the veggies to your wrap, fold up and enjoy. 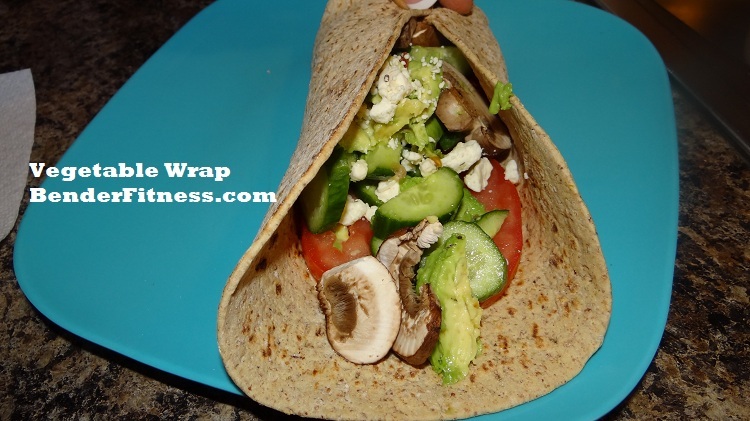 Is a wrap a tortilla? It can be a tortilla. There are all different kind of wraps. I typically get whole wheat or whole grain wraps. doesn’t look bad at all, but I’m thinking some mustard or something cause it does look a little dry. I’m 14 I weigh about 180 pounds and I want to get atleast to 170 by the end of next month, do you think it’s possible?